DORMAA AHENKRO, Ghana, Dec. 6, 2018 /PRNewswire/ -- The U.S.-based African Bicycle Contribution Foundation (ABCF) recently distributed an additional 50 free bamboo bicycles, to under-resourced students in rural Ghana. 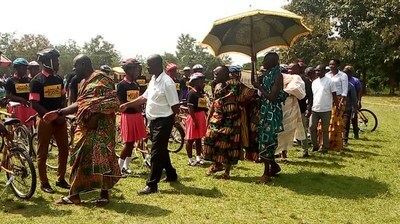 This time, in its 11th distribution event, the Foundation contributed bicycles in the Dormaa District, Brong Ahafo Region, in Southwest Ghana. The Dormaa District distribution actually marks the second ABCF distribution in Brong Ahafo and brings the total number of bicycles contributed by the Foundation to 340. The Foundation's fifth bicycle distribution event took place on July 26, 2017, in Amasu, in the same Brong Ahafo Region. According to Bernice Dapaah, the founder and CEO of the company, in Kumasi, Ghana, that manufactures the EcoRide bamboo bicycles that are sponsored by ABCF for its distributions, the Dormaa District is one of the Southwest districts in Ghana with the greatest need for educational support, and is also home to a significant number of rural students who are challenged to travel significant distances, on foot, from remote communities to their learning centers. A 2018 survey in the "Journal of Economics and Economic Education Research" titled "Dropout Issues and its Economic Implications: Evidence from Rural Ghana" disclosed that the prominent factors identified to influence dropouts included poverty, low levels of parental education, corporal punishment and long distances to school. In addition, a 2014 report by the Ghana Statistical Services disclosed that "there is a huge gap in educational attainment between urban children and their rural counterparts. Only eight percent of urban-dwelling children had no education, while almost one in every four children in rural dwelling had no education." 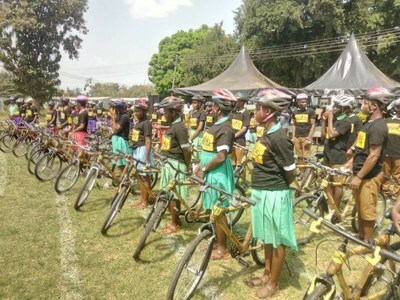 The recipients of this most recent ABCF bicycle distribution were drawn from several senior high schools across the District, including the Dormaa Senior High School; the Dormaa Adehyeman and Dormaa Wamafo Senior Schools. Commenting on how the new bicycle would impact her own pursuit of education, one of the recipients, Azuori Philpa said: "This bicycle is very much appreciated because it will help me to avoid late evening travels on risky footpaths and save me more effective hours to devote to learning." Among the officials in attendance at the distribution event were Barimah Dei-Kusi Gyabaah II, of Dormaa Ankobeahene; Barimah Yeboah Kodie, of the Dormaa Adauanahene and Aboabo No.3 hene; Maxwell Mensah, Deputy Coordinating Director, Dormaa Municipality, and Thomas Asante Armstrong, Head of Inspectorate Division GES Dormaa; and School Principal Nicholas Asamoah. According to Head of Inspectorate Armstrong: "The bicycle has the great potential of eliminating the key bottlenecks some of the students face, including absenteeism, and fatigue from long-distance travels to school. We hope that with this challenge out of the way and the risks minimized, they will improve on their key performance metrics." "We at ABCF, and our partners in the U.S. and in Ghana, clearly understand the direct connection between Ghanaian student access to education and the successful future they can build for themselves, their families and communities," said Patricia Marshall Harris, the Foundation's executive director. "It seems as though it was only yesterday that we launched the Foundation with our first bicycle distribution in Kumasi. We have now, however, distributed a total of 340 bicycles in 10 districts throughout Ghana and are quite anxious to do all we can to buy more of these wonderful Ghanaian-made bamboo bikes and to get them into the hands of as many under-resourced students, small farmers and healthcare workers, as possible." The African Bicycle Contribution Foundation (ABCF) is a 501©3 non-profit corporation whose mission is to generate funding to underwrite the distribution of bicycles to under-resourced students, teachers, and transport-dependent small farmers and healthcare workers, in Ghana. The Corporation has made a commitment to finance the free distribution of 2500 bicycles in Ghana, over its first five years of operation. ABCF works in partnership with the Ghana Bamboo Bikes Initiative, which produces the iconic Eco-Ride bamboo bicycle; the Bright Generation Community Foundation, the Respect Alliance, and the U.S.-Ghana Chamber of Commerce. Included among the foundation's corporate and charitable non-profit sponsors are Independence Blue Cross, PayPal, ARAMARK, Global Advisory Services, the Omega Chapter of Alpha Kappa Alpha Sorority, Dr. and Mrs. Colin A. Romero and Millennium 3 Management, Inc.